I've been bitching about how much I want to get a pair of fancy Hunter rainboots for like a year now, eh? Why? Perhaps because rather than the $25 I spend every year to replace yet another pair of rainboots from Target or wherever, only to find out at the most inopportune times that they have cracked (because you're only wearing rainboots if it's raining, and therefore daring the universe to allow cold dirty water to swoosh into your socks and make you miserable the whole damn day) and that no, superglue does not provide an acceptable solution with which to repair cheap crappy rubber rainboots, I should just shell out the $115 on a pair of lovely all-weather classic Hunters and get over the fact that I'd have just spent $115 on rainboots. Yes, that epic run-on sentence was totally necessary to impart my thoughts on this subject. They'll still crack. It'll still be at an inopportune time. You'll just have spent more money to get there. That is both deeply disappointing and extremely useful information. On to Target with my $25 once more. You know, I might be tempted to think, "Rainboots? REALLY?" But then there was that one time I walked an incredibly long time in the pouring rain in Chicago to get to a farmer's market while wearing sandals. And I spent the ENTIRE time wishing I was wearing rainboots, like the person leading us. So I have nothing to add. 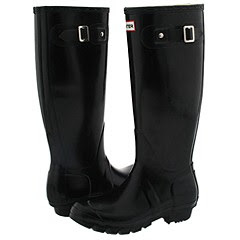 hunter rainboots are on gilt fuse today! just 48 bucks!